I devoted many words already to the advantages of genetic engineering. On paper, in the form of books and columns, as a speaker at schools, congresses, women’s associations, service clubs, and in churches, libraries, in short when and where I was invited. And I am not the only one riding this hobbyhorse; many journalists do likewise. 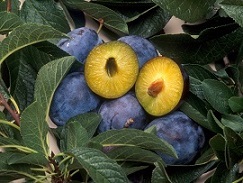 Plums genetically engineered for resistance to plum pox, a disease carried by aphids. Do these words actually lead to anything? No. At least not in Europe, insofar as genetic engineering of plants is concerned. That has been banned for decades by anti GMO movements like Greenpeace and Friends of the Earth, which I will refer to as the Greens for the sake of convenience. They have become very clever at manipulating politics in Brussels. They do not shy away from publicly accusing opponents of lying, and to shout that they should shut their big mouths. At least, this is what happened to me. Literally. But I would still like to ride my hobbyhorse once more. Because in recent years much scientific and other evidence has surfaced that plant genetic engineering is beneficial for yields, the environment, health and the economy. Put even more strongly: it is immoral not to make use of it. Contrary to what the Greens say, pesticide use has been reduced (by 37%) as the result of genetic engineering; yields rose by 22%, and so did farmer’s incomes (by 68%) – not just Monsanto’s! Moreover, yield and income increases in developing countries exceed those in developed countries, and 53% of transgenic crops are grown in developing countries. I found these figures in a German meta-analysis (147 scientific publications) that I read early 2015 in PloS One of November 2014. The Greens deny this, referring to studies that have repeatedly been shown incorrectly conducted, not reproducible, or even fraudulent. 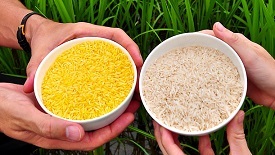 Golden rice is a variety enriched with pro-vitamin A by genetic engineering, which can prevent blindness and death by vitamin A deficiency. Justus Wesseler, a professor in agricultural economy at Wageningen University, calculates in his mid-2015 oration that the ban on golden rice, exacted from policy makers by the Greens’ lobby, cost India alone 1.4 million years of life lost during the first ten years of commercial availability of this variety. And he calculates that the ban on transgenic sugar beets and maize costs the EU 100 and 130 million Euros annually, respectively. The ban on golden rice angered Patrick Moore. In its early days, Dr Moore was president of Greenpeace Canada for nine years, and seven years director of Greenpeace International. In 1986, he broke up with this organisation. The reason for him was the lack of scientific proof for their actions. At a symposium in Winnipeg in 2012, he answered to questions that he looked upon the banning of golden rice by Greenpeace as a crime against humanity; in 2015 he was the campaign leader of Allow Golden Rice Now! Like him, I am convinced that golden rice can contribute to relief of vitamin A deficiencies, but like the UN I feel that many more angles need to be covered in order to tackle this complex problem successfully. A more recent convert is Mark Lynas. His opening remark in his speech at the 7 January 2013 Oxford Farming Conference was that he apologised for the destruction of GM crops for many years, and for the ensuing demonization of an important technical environmentally responsible option that would also benefit food supply. The reason for this conversion and this apology? He had discovered science! A pity that he was a bit late in this discovery, but anyway, better late than never. A second meta-analysis that I read by the end of 2015 treats 1783 studies on safety and environmental impacts of transgenic crops. This analysis concludes: zero health risk. And no demonstrable diseases have been found as the result of animal or human consumption of transgenic crops for many years. In short, we are mad and morally irresponsible if in Europe we do not embrace genetic engineering across its full width and depth at a short notice. This is an enlarged version of my column Stokpaardje (Hobbyhorse) that appeared 18 March 2016 in C2W Life Sciences. Hans Tramper is an emeritus professor bio process technology, Wageningen University.